CST released their antisemitic incident report for the period of January-June, 2017, and the results are troubling. 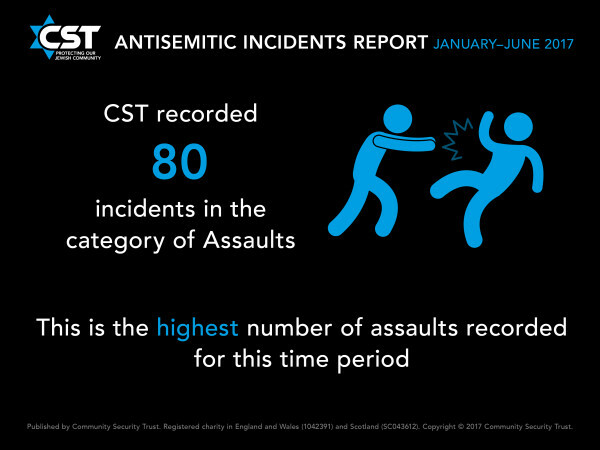 CST recorded 767 antisemitic incidents across the UK in the first six months of 2017, a 30 per cent increase on the 589 incidents recorded in the first six months of 2016. This is the highest total CST has ever recorded for the January-June period of any year. The second highest total was in 2009, when CST recorded 629 antisemitic incidents. CST has been recording antisemitic incidents since 1984. The long-term trend shows that the number of antisemitic incidents has been at a sustained higher level since the summer of 2014, when incident totals increased sharply in response to conflict in Israel and Gaza. Average monthly antisemitic incident totals are now more than double what they were in 2011-2013. CST recorded 80 incidents in the category of Assaults during the first six months of 2017, a 78 per cent increase from the 45 incidents in the category of Assaults recorded in the first half of 2016. This is the highest number of incidents in this category that CST has recorded for this time period. CST recorded 142 antisemitic incidents that took place on social media, comprising 19 per cent of the total of 767 incidents recorded during the first half of 2017. In some cases, social media has been used as a tool for coordinated campaigns of antisemitic harassment, threats and abuse directed at Jewish public figures and other individuals. CST received a description of the ethnic appearance of the offender or offenders in 208 of the 767 antisemitic incidents reported during the first six months of 2017. Of these, 106, or 51 per cent, were described as white – north European; five, or two per cent, were described as white – south European; 36 (17 per cent) were described as black; 50 (24 per cent) were described as south Asian; one (one per cent) as east or south-east Asian; and 10 (five per cent) as Arab or north African. These proportions are broadly typical for a period when there is no trigger event from the Middle East. Anti-Muslim incidents have increased by a far greater amount in the Manchester area. Perhaps the way incidents are now recorded. The definitions? What is the increase in percentage terms, or actual incident numbers? One minor query. I don’t know if it is still the same in the UK (not living there) but in my younger days assault was not the same as battery. Assault meant the threat of violence, as in raising fists or pointing a gun, whereas battery meant actual physical contact, anything from putting your flat hand against somebody’s chest to actually battering with fists and feet.. So do the figures on assault refer merely (merely!) to the threat of battery, or do they include a limited amount of physical violence, rather than the extreme violence of the top line. jan, hopefully to answer your query. So then the second line in the table of Antisemitic Incidents by Category refers to people shouting, shaking fists and in other ways making Jews afraid that physical violence might result, without actual physical violence taking place. That is still pretty nasty, and certainly not civilised, but I think nonetheless we should look at that table and make a slightly different evaluation. Please, that is not an excuse for permitting such incidents, just that Jews shouldn’t immediately book the next ferry or plane. The CST is as bent as a wad of £9 notes. There is money in themk there antisemitic incident reports is there not Gerald R ? If you have evidence to substantiate your claim, then either post it for all to see or withdraw your claim. Your constant flinging around accusations without providing a scintilla of proof to support those accusations is getting increasingly boring. Another accusation spewed out without any substantiation, and this time with a dose of illiteracy added to the mix. If you must behave in the same fashion as a naughty five year old who thinks he is being clever or amusing by running into a room full of adults and shouting out swear words, (which he doesn’t understand) then running away again and hiding behind the garden shed. I have news for you Stephen, you are not clever or amusing. Your behaviour in a five year old would be tiresome, but in an alleged adult it is pathetic. Grow up! Oh I have Gerald I have. Stop behaving in such a childish fashion. You sound just the same as a five year old when he says “I know a secret about you”. It is called an ’empty secret’ because the same as your fantasies and conspiracies Stephen it consists of nothing. Just a childish outburst with nothing to back it up. Stephen if you have evidence then either put it up or shut up! And for Gods sake grow up! Really Stephen, so what caused you to revert to infantile/childish behaviour? Is behaving like an adult too exacting for you with your limited intelligence? Again Stephen your narcissism is giving you an overblown sense of your own self-importance. I don’t fret about your inability to substantiate your posts Stephen, it’s what I expect from you. On the scale of existence on this Planet, that is Planet Earth not the Planet infested by you and the other anti-Semitic looney-tunes, you are somewhere between dog excrement and a carcass with some blood but no backbone or brain. But Gerald I did substantiate the post. Gerald you are a google whiz kid. Can you tell us how many of these assaults were reported to the police and how many prosecuted ? Oh don’t bother my wife just whispered the answer in my ear. Poor little Stevie, now he is hearing voices. Of course you did little Stevie. And any other evidence you had the dog ate along with your homework. Yes or little Stevie will throw a temper tantrum and scream and scream and scream until he is sick! Violet Elizabeth Bott had a lisp. And I got that without benefit of google too. Gerald did you google night follows day ? Stephen I was not referring to a fictional character, but to YOU and your childish behaviour including your tantrum throwing Stephen when you are challenged again on making unsubstantiated accusations and being without any credibility. But if it stops little Stevie Bellamy from throwing a temper tantrum, go ahead. Your attempts at diverting attention when you are caught out have never been, and are still not, successful.